There’s only so much you can say about Rob Handel’s delectably intriguing play A Maze without spoiling the fun. The first thing to know is that the play was first produced in the Bay Area last summer by Just Theater at the Live Oak Theater. 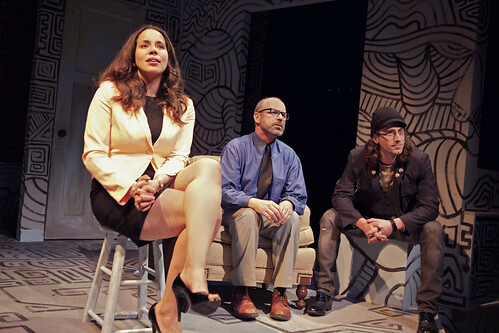 That production generated such buzz, both from critics and audience members, that the astute folks at Shotgun Players pricked up their ears and decided to re-mount that production at the Ashby Stage. The re-mount brings back the original cast of eight under the direction of Molly Aaronson-Gelb, and though I didn’t see the show last summer, it’s hard to imagine these performances are not sharper and more astute this time out. Aaronson-Gebl and her actors present the best possible case for Handel’s play as one of the juiciest, most involving dramas to be seen on a Bay Area stage in recent months. What’s so exciting about A Maze is watching how expertly these actors handle the careful unfolding of Handel’s complex, multifaceted tale. Without giving anything away, there are three main plot strands. The first involves a 17-year-old girl named Jessica (the astonishing Frannie Morrison) who has recently escaped from eight years in captivity. She was abducted from a grocery story at age 9 and has come out of her ordeal with remarkable poise and camera-ready intelligence. The second involves a fractured rock band called Pathetic Fallacy in the wake of a giant hit called “I Want Love Brought to Me.” Boyfriend-girlfriend band members Paul (Harold Pierce) and Oksana (Sarah Moser) are making some big choices that will likely affect not only the future of the band but also their relationship. And the third revolves around a graphic artist named Beeson Earwig (Clive Worsley giving a jaw-droppingly good performance) whose multi-volume graphic novel, numbering in the thousands of pages, is building quite a cult following. What playwright Handel does with time and the weaving together of his plot threads and shifts into fantasy is remarkable, and by the end of Act 1, he has the audience so in the palm of his hand that they would happily skip intermission and dive straight into Act 2. There’s a whole lot more plot, and within this labyrinthine creation there’s an interesting discussion about the lives of artists, the separation of artist from the art and the heart of creativity, but it’s all craftily entwined in plot and increasingly interesting characters. Rounding out this exceptional cast is Lasse Christiansen, Janice DeLucia, Carl Holvick-Thomas and Lauren Spencer. I can’t say enough about the sharp, incisive details in these performances. Even in the scene transitions (on Martin Flynn’s maze-covered, mostly black-and-white set), we get insight into characters as the actors head on and off the stage. It would seem that there’s not one detail, from Miyuki Bierlein and Ashley Rogers’ expert costumes to Michael Palumbo’s lighting design, in this 2 1/2-hour production that has not been given careful consideration by director Aaronson-Gelb and her team. It’s easy to get lost in this Maze, but being lost has rarely revealed such rich theatrical reward. I chatted with A Maze playwright Rob Handel for the San Francisco Chronicle. Read the story here. 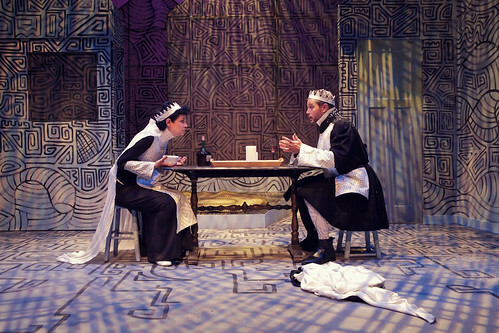 Rob Handel’s A Maze continues through March 9 at the Ashby Stage, 1901 Ashby Ave., Berkeley. Tickets are $20-$25. Call 510-214-3780 or visit www.justtheater.org.